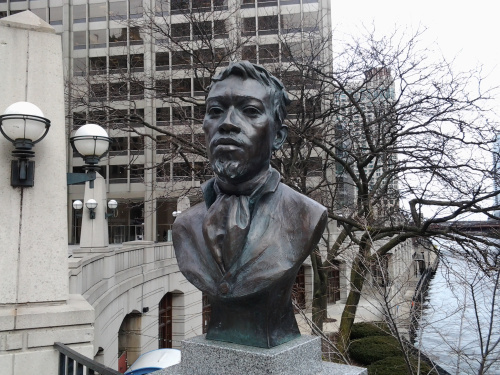 Few documents record the early life of Jean Baptiste Pointe De Sable (“DuSable” is the English corruption of the original French spelling). The latest theory is that he was born to a slave mother of Haitian ancestry in 1746. They were both set free by her owner Jean Brunet (after whom the Illinois town of Bourbonnais is named). He married a native woman named Catherine and on March 13, 1773, Jean Baptiste Pointe De Sable bought a 3 acre farm on the lower Illinois River. Their home was not far from where a major east-west Indian trail crossed the river and young Jean Baptiste began his trading career there. He and Catherine had two children; Suzanne and Jean Baptiste Jr. before leaving the area. The large, handsome, intelligent and well-liked trader sold his Peoria property and began trading for William Burnett at his post on Trail Creek near present day Michigan City, Indiana. But shortly after his arrival in Indiana in 1779 he was arrested by the British who suspected him of giving aid to the Americans. He was held prisoner on Mackinaw Island until the commander of the British fort put him to work managing his lumber farm and mill called “The Pinery” near Detroit.